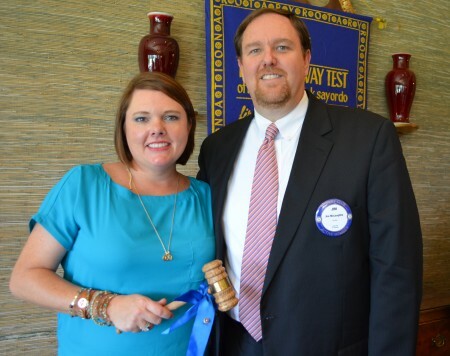 The Auburn Rotary Club recently installed Auburn Municipal Judge Jim McLaughlin (right) as its 2013-14 club president. McLaughlin succeeds Martee Moseley (left), and is pictured receiving from her the gavel following its succession through the hands of all previous club presidents in attendance at the club's June 26 "Passing of the Gavel" tradition. The president's gavel, pictured with the pair, is made from the Tuskegee, Ala. Friendship Tree planted by Rotary International founder Paul Harris in the mid 1940s.